I've engrossed myself in so many games these past few days, all for the purpose of reviewing them soon. For instance, I finally finished up Spyro Reignited Trilogy, and I only played the original Spyro the Dragon back on the PS1. Wait. I actually go into that in my review, so why don't we just get on with it?! There might be three games in this trilogy, but they won't--wait for it--"drag on". Thinking back, I don't have that many fond memories of the original Spyro the Dragon. Sure, it was fun, but the most prominent thought that I have is how the game gave me a severe headache upon playing it for any lengthy duration. It's like those rough, jagged polygons cut directly into my head, causing me pain and agony. Okay, maybe that's a bit on the dramatic side. Regardless, I never did finish Spyro the Dragon when it released, and due to my rather unflattering experience with the game, I never touched the sequels. Now that Spyro Reignited Trilogy is out, I'm basically able to play 2-1/2 brand-new games (for me at least) with enhanced sight, sound, and visuals that definitely didn't give me a killer migraine. 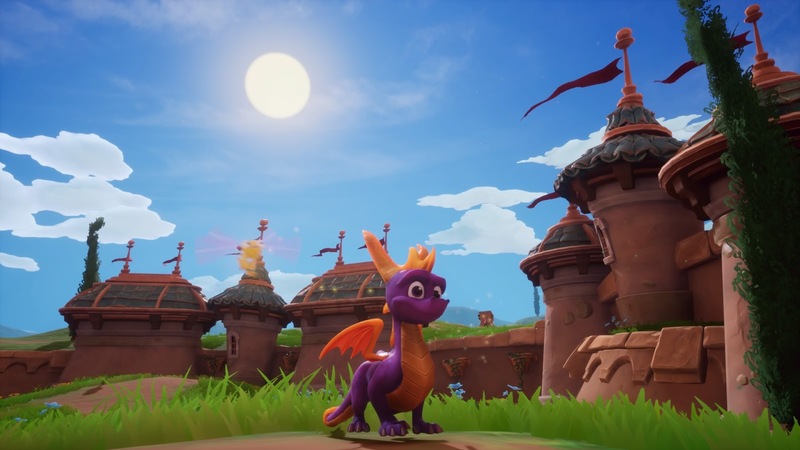 Spyro's back, and while it may be cliche to say, he really is better than ever. 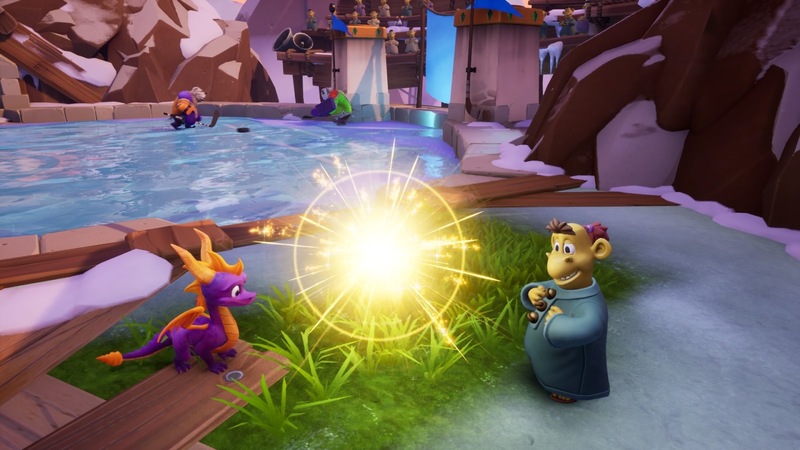 Playing the games in order within the Spyro Reignited Trilogy, you really get a feel and understanding for how the series evolved over the course of three games. Starting off with--where else but Spyro the Dragon, the game lays down the groundwork for the future entries. "Oh, wow, Phil. Great analysis. No first game in a series has EVER laid down a foundation for sequels." 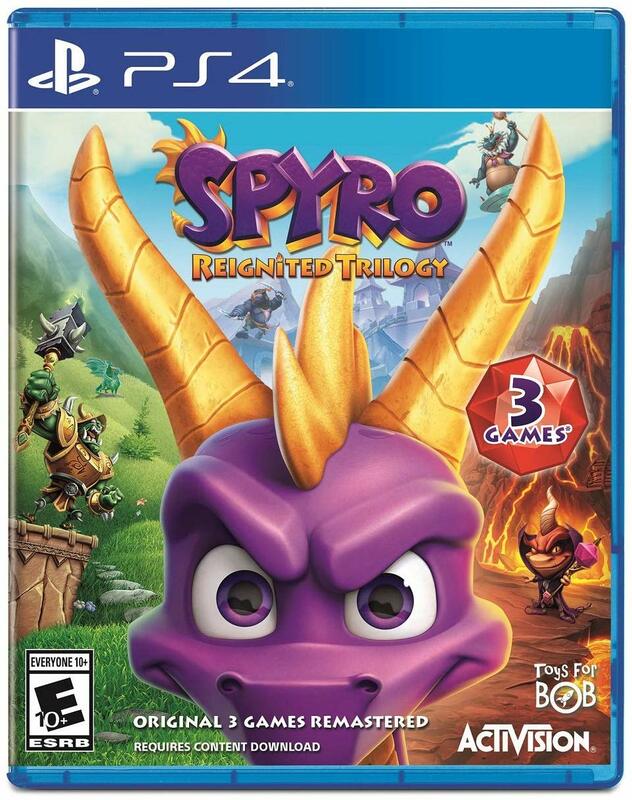 Okay, sarcasm from the peanut gallery aside, Spyro the Dragon is obviously the simplest of the three games, but at the same time, it's a quite lean game. There is no real fat or filler to speak of. Pretty much every level has a required goal, and that's to reach the exit. Most levels have one true path to follow, but many also feature detours for rewards. Open those wings and take flight, young dragon! Of course, like every other game in the series, it behooves you to do some exploring, as later areas in Spyro the Dragon are locked behind collectibles. These consist of rescuing the Dragon Elders who are encased in crystal, as well as gathering gems scattered about in levels, whether on the ground, in chests, in vases, and so forth. Spyro 2: Ripto's Rage is probably my favorite game of the package. It has just the right length, just the right amount of meat to it, and creates multiple new play styles that mostly all work. In Ripto's Rage, Spyro's cast of characters expands rather greatly with a handful that appear and reappear in the hub worlds to help the precocious, purple dragon out, as well as one-off characters that guide you through the base levels. The goal of many of these levels is the same--get from the beginning to the end. It's just that they're dressed up with some narrative and quest-like design to give some context to each level, rather than just throwing the player in a given level and having them get to the end with little context to offer like the original Spyro does. A successful game of hockey wins Spyro his reward. 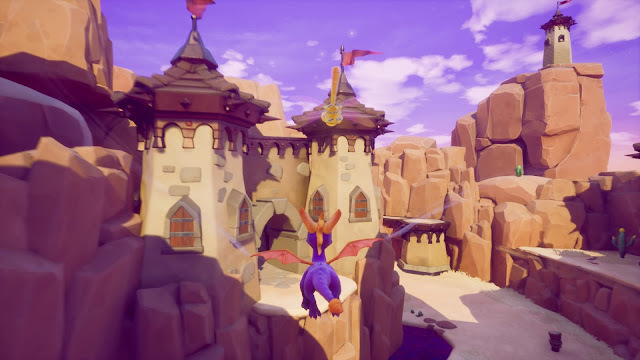 Furthermore, Spyro 2 adds some side missions to complete within the levels of the game. These reward special relics that serve as the primary collectible of Ripto's Rage. These are on offer for things as simple as solving an engaging platforming task to participating in a mini-game, such as a game of ice hockey, thwarting turtles from having some soup by knocking them into the surrounding pools of water, among many others. Spyro 2 also takes the Banjo-Kazooie route by adding new moves that Spyro can learn, such as swimming and climbing. Swimming is a mixed bag in execution, but there's really never a moment in the game where you need masterful precision to survive or proceed through a submerged underwater section. "flattened like a pancake" quip--that previous statement notwithstanding. Finally, Ripto's Rage is the sole game in the trilogy that bookends each of its levels with comical cutscenes that sometimes hit the mark, but other times didn't really get a chuckle from me. They're all presented beautifully and impressively, even if the humor isn't on point 100% of the time. Your mileage will of course vary. Spyro: Year of the Dragon is the final game in the trilogy, and it expands its levels and objectives inside them to much greater size. Whereas Spyro the Dragon took me about five hours to 100% and Ripto's Rage had me put in about 7-8 hours to complete, Spyro: Year of the Dragon was a 10 hour journey to fully complete. It was also spread out across more days than both of its predecessors just because unlike Spyro 1 and Spyro 2, levels take quite a bit more time to fully beat. Part of that is the implementation of a wide variety of gameplay styles. Unlike Ripto's Rage, however, some of these don't stick the landing well at all. 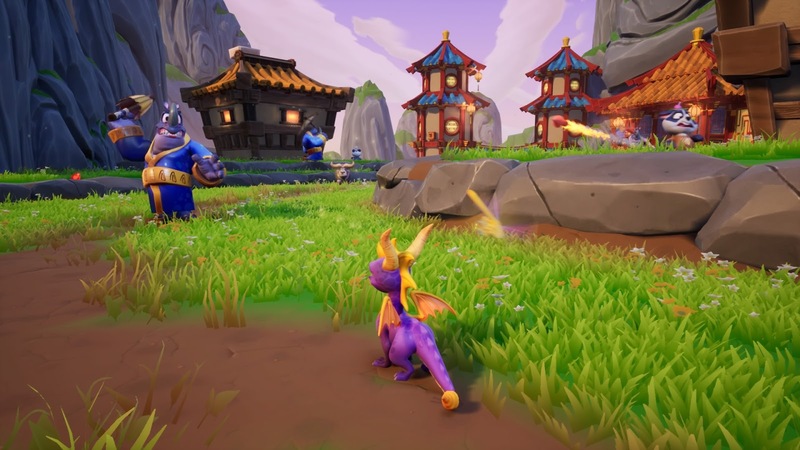 While it'd be disingenuous to say that Year of the Dragon is the jack of all trades and the master of none--because the standard gameplay as Spyro is as sharp as ever--a good number of the variety of gameplay types rubbed me the wrong way. There's the hoverboarding that takes place in both trick and race formats, where performing tricks and landing the tricks can be mighty particular. Throw in some odd physics and collision detection here and there in these sections, and you have something that can irritate. Moreover, Year of the Dragon boosts the supporting cast with includes additional playable characters other than Spyro. 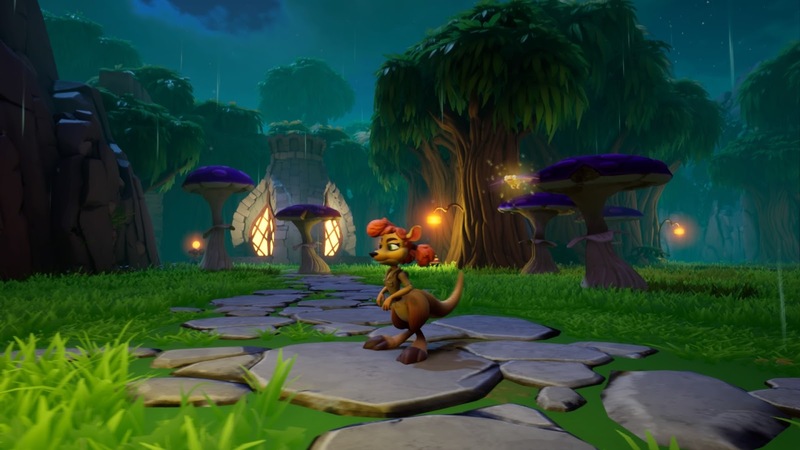 From a bouncing kangaroo to a trigger-happy monkey, these provide a welcome reprieve from the traditional Spyro platforming and gameplay, but this also has some stinkers with the amount of gameplay types included. Thankfully, most of these work well, but the ones that don't, like the explosive-toting bird's Molten Crater mission, feature haphazard, almost glitchy camerawork that devolves into a less than satisfying experience. Make yo' kangaroo wanna... JUMP! JUMP! Spyro, his companions, and his world in his return-to-form Reignited Trilogy look absolutely sensational. Looking at comparison shots from the PS1 originals to these Reignited re-imaginings is something to behold, as the developer really nailed the atmosphere and environments of the original trilogy while breathing new life into them. The characters express themselves well, and the amount of detail and visual variety is magnificent. Perhaps my only actual issue with the visual piece of Reignited Trilogy is the gratuitous use of motion blur with no ability to turn it off. While it's not absolutely dizzying or nausea-inducing, it still is a notable detraction to the game's aesthetic. Each level, regardless of the Spyro game you play, looks positively stunning in its remade glory. Meanwhile, the voice acting in the game has been fully reworked, but sadly, there is no option for subtitles. (Pretty crappy to not have this patched by now, Activision, for those that are hearing-impaired players.) The music, too, has been updated with the help of the original composer, but like the PS1 trilogy, the songs in Spyro Reignited Trilogy just come off as window dressing for the ears, as they didn't really stay in my head after I quit playing the games. I couldn't hum you any of the songs if you asked me to. Spyro Reignited Trilogy to me is a much greater platforming success than Crash Bandicoot: N. Sane Trilogy is. Perhaps that's because I actually enjoy all of the games in the collection, and I find them well designed in the first place--unlike certain levels or entire games of Crash in general. 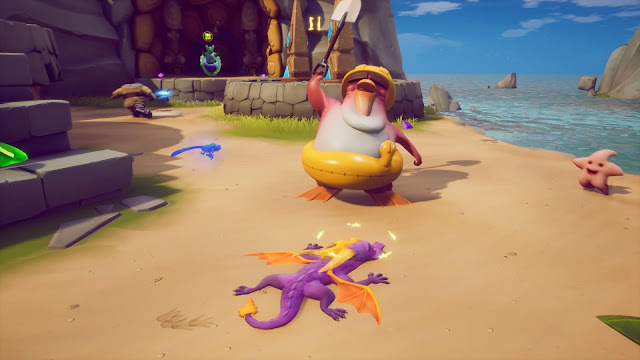 Regardless, while there are annoying spots in the latter two games in the Spyro trilogy due to spreading out into different gameplay types, overall, Spyro Reignited Trilogy controls like a charm, plays like a dream, looks like a winner, and satisfies (mostly) from beginning to end.